The castle gates stand only a few feet away, but a wave of enemies blocks your path. 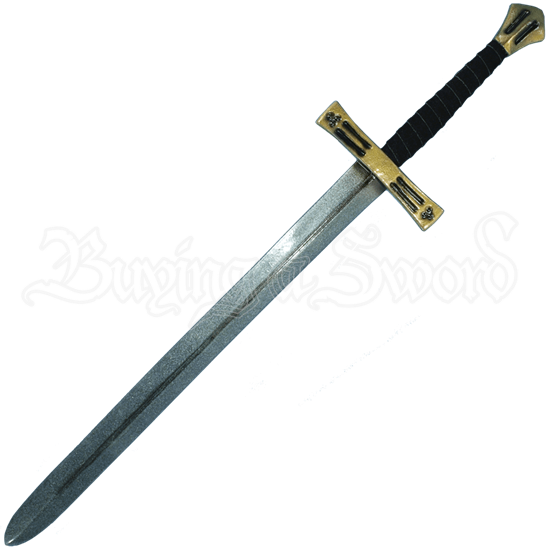 The First Crusader LARP Sword moves skillfully in your hands as you pave the way for your troops to reclaim the castle and save your noble ruler. Painted by hand and sculpted with special attention to detail, this knightly sword mirrors its historical counterpart. A deep fuller runs down the center of its double-edged blade. Split-leather reinforces the handle, supporting a firm, comfortable grip. A beautiful finish and engravings decorate the wide cross-guard and pommel. The sword is approximately 43.5 Inches in overall length. This measurement will vary slightly as these are handmade items. Latex weapons do need to be maintained to a certain degree. We offer a Maintenance Silicone in our LARP Accessories section. We recommend you use the silicone on a regular basis. It has an easy, spray on application. The silicone will keep the coating flexible and increases the lifetime of the weapon. It also prevents the coating from drying out and improves resistance to wear and tear. I purchased this for my human fighter LARP character for use in the NERO system. My only previous experience with foam-latex weapons was a two-handed Chaos Claymore (the old version, red one) from Forgotten Dreams. Perhaps I'm comparing apples to oranges (or claymores to longswords, in this case), but the construction of the Forgotten Dreams brand just seems better. First, the color of my blade came painted in that silver-flake kind of paint, which really bothers me from an athletics point of view. I would have preferred matte gray, but that's not how they make them, I guess. Second, this sword feels heavier, than I expected, but not stronger. For example, there's nothing beneath the surface that I can feel that will reinforce the crossguard quillions, which I can depress and bend around way more than I expected. The quillions are very "squishy" and not reinforced in any way. I'm honestly a little concerned about the quillions tearing off over the course of extended use, thereby ruining the look of the sword. The same can be said for the pommel, it's very also very squishy, but at least, feels secured by the VERY sturdy grip. Seriously about that grip, it feels SOLID. I'm not sure if the faux-leather wrap on the grip will last, but brand new, it feels VERY tightly secured to the grip. Let's talk about the blade, also, squishy. This sword is really all around very, VERY squishy. Since I previously compared it to a Forgotten Dreams weapon, I'll say that my Forgotten Dreams sword had just enough give to make it not hurt when hit by it under the NERO LARP contact rules. But when I hit you with my Forgotten Dreams weapon, the other person was absolutely going to feel it. The blade on this one feels squishy (I keep using that word, it's the accurate, I think), it has a lot of give. I couldn't compress my Forgotten Dreams sword enough to feel the core through the latex, this one from Epic Armoury is easy as heck to feel the core through the foam on the blade, you don't even have to press very hard. I think that the blade will be sufficient to pass safety, it doesn't feel dangerous, there is enough foam in the blade to make it feel safe, I truly believe this. When hit with it, I can't feel the core. I don't think it will have a problem passing safety at my local NERO chapter, but I'll admit I'm slightly concerned with the ability to feel the core in the blade when you squeeze down. The thought of not passing safety never even occurred to me with my Forgotten Dreams weapon. You couldn't feel the core (roughly the same blade width), no matter how hard you tried. I can definitely feel the core on the this one, but you do have to be trying to, because the blade striking surface has so much give. The dimensions are exactly as described on this website. And I had no problems at all with the ordering process. Just remember, shoppers really need to click the "IN STOCK?" link, and verify that the item you want to buy is actually in stock, because unless you read your invoice or receipt that they send you, you won't know that you just paid for something that won't be coming. I verified the item was in-stock before ordering, and it arrived just fine within the week (standard ground shipping). In closing: - I like this sword, even though the flakes in the paint on the blade bother me. - I'm a bit concerned with its construction quality in terms of lasting over years of use. I'm concerned about the quillions tearing off and I kind of expect it to happen when another sword hits mine, then slides down the blade, and finally hits them at the crossguard. - The blade material is WAY squishier than a Forgotten Dreams weapon. It makes the weapon feel cheap. Like something one might find in a Halloween store, rather than a high-end LARP weapon from a dedicated retailer, and custom-built for a specialized market. However... I haven't actually used it in-game yet, I've only had a chance to boff around the yard with it, not the same way you'd do it with an adrenaline rush at an actual event. 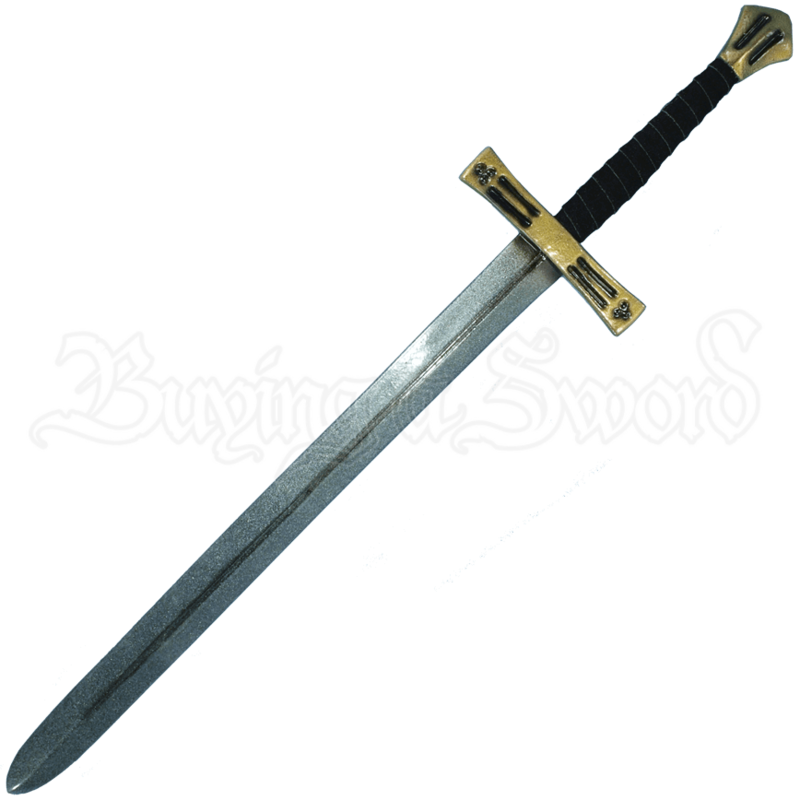 - I do recommend this weapon, but I'd temper a buyer's expectations for it to be an "adequate" addition to your LARP kit, rather than an "AWESOME!" one. - I would buy weapons from the Epic Armoury brand again in the future.